During S.E.E. 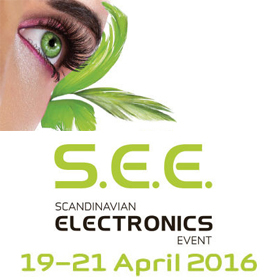 (Scandinavian Electronics Event), state-of-the-art electronic solutions are presented; it is also a place of business meetings. The organizer of this trade fair, the Swedish Electronics Trade Association, ensures the high quality of the event and takes care of an interesting seminar programme. Thanks to this fact, S.E.E. attracts numerous companies, professional service providers and distributors of electronics; it is also a place for making new contacts and establishing new business relations. Come to see TME’s representatives at S.E.E. trade fair!